The Shadow Inventory = Shadow Gibberish? One of the more remarkable methods used (even by "Intelligence Agencies") to establish if something is true or not is to is to label it true if it came from a "reliable source". Who said it? If he or she is considered reliable or an authority the data is considered true or factual. The other – perhaps even more silly – system in use is multiple report. If a report is is heard from several areas or people it is "true". Five or ten people hear the same thing and pass it along, it becomes a "fact". I have been hearing about the Shadow Inventory for well over a year now. It is HUGE. It is sensational. A Big Giant Tsunami (BGT) of inventory is going to be unleashed by the lenders. Get ready. Like nothing you have ever seen. The housing market will be flooded with inventory like never before. No doubt it will change life as we now know it. Only it is complete crap. Nothing but invented data dreamed up and endlessly passed along by organizations and individuals who heard it from someone else (I have not yet tracked the original source for this shadow inventory nonsense as it seems to emanate from "everywhere"). What is really interesting are all the "new facts" dreamed up by "industry observers" to make the Big Giant Tsunami theory still possible – in spite of the overwhelming abundance of easily observable data that would directly contradict the idea of the banks having this huge inventory that they are holding back to be released later. I bet I have your attention now. Some of you may even be angry – you damn well KNOW there is a shadow inventory!!! So lets look over why I am publicly saying it isn’t true and what the thought process was for the people and organizations who have been saying (and continue to assert) it is true. These people would have no reason to intentionally forward false data. So what data did they look at to conclude there was a Big Giant Tsunami of inventory the banks have and aren’t releasing? Charts like this – graphically showing the Shadow Inventory are all over the the media and the internet. 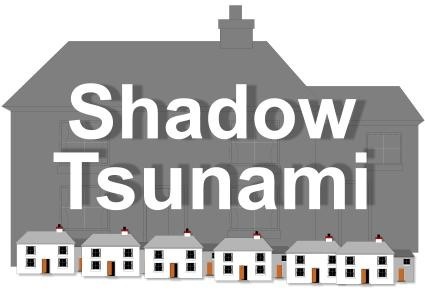 So what system is being used by economists and others to calculate this shadow inventory? 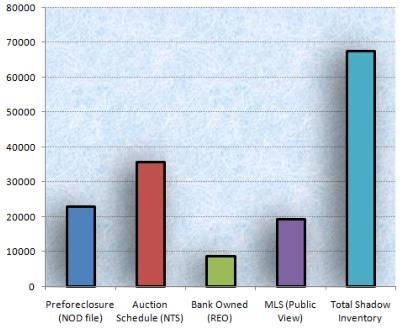 Simple, take the cumulative total foreclosures recorded (the big number) and subtract the current active and pending inventory in the MLS, plus the sold MLS properties (the little number) and the remaining number is "the shadow inventory". Simple, quick and it requires NO LOOKING at anything – just grade school level math. To be clear, I am NOT referring at all to any foreclosures yet to come. Inventory the banks may wind up getting in the future. I am only talking about NOW. It is no secret that REO agents are losing market share as they, as a group, have less and less inventory being given to them by their asset managers. These same asset mangers who – last year – kept telling them that they had a lot more coming in to give them. It just never arrived for them to give. The only REO agents I know who are doing better these days are those REO agents who deal in higher end homes. Those high end agents are getting inventory, lots of it. This is not to say that all across the country there is no REO inventory, there is – just less and less of it. The BGT crowd has invented the idea that the banks have the inventory but are keeping it until the prices go up! How about a few facts that I know are true here in the Phoenix area – and I have every reason to believe are true right across the country (as I can think of NO reason for these facts to only be true here). Fact: In my local MLS, there are about THREE TIMES as many bank owned homes listed in the MLS as the MLS actually shows. I know this because two guys who actually look counted them all. One by one. (Mike Orr of The Cromford Report and Tom Ruff of The Information Market) They counted them and compared the addresses shown in the MLS, one by one, with the County Assessor records. These are homes listed by banks who instructed the listing agent to NOT use the term "bank owned" in the listing. Tom Ruff and Mike Orr spent months going over every deed transfer in Maricopa County (Looking at each foreclosure going to the bank and tracking that house for its current ownership and they could directly account for all but about 5,000 houses) and established that for the Greater Phoenix Area THERE IS NO SHADOW INVENTORY. Fact: Major banks often off load huge portfolios of inventory to hedge funds. Huge portfolios. Anyone or any organization who is claiming that they are "tracking" what the banks are doing who does not have sufficient access to track those portfolio sales is simply engaging in the simple grade school math referenced five paragraphs above. No doubt there will be some readers who remain convinced that what they have read about and then co-created must be true. That’s okay. If you are happy believing that a Big Giant Tsunami is coming – enjoy the wait. However, I’m betting you remain completely dry. You are currently browsing the Number 1 Home Agent blog archives for January, 2010.